One genre of books that I have started enjoying a lot recently is, without a doubt 'Indian mythology' or 'mythological fiction'. The two great epics of the Indian history are Mahabharata and Ramayana. I have already read two Mahabharata centered book – Jaya by Devdutt Pattanaik and Palace of Illusionsby Chitra Banerjee Divakaruni, so my next choice of mythological book was Ramayana centered. One of my blogger friends suggested me to read the Ramayana series by Ashok K. Banker. That I did as I got the first book of the series from the local library here. I enjoyed the book thoroughly only to discover later that the library does not have any other books of this series and hence I had to wait for my India visit to get my hands on the rest of the series. The bestial demon hordes roar towards Ayodhya having swept all before them. Rama cannot return home to defend his family. 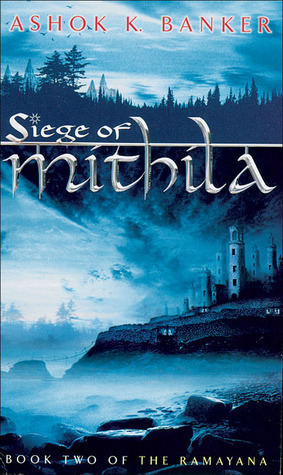 He must journey to Mithila—a city lying directly in the path of destruction—to join a small band of heroes planning a valiant stand against the armies of darkness. Can Rama unearth a hidden dev-astra to help in his battle against his nemesis, the demon lord Ravana? Of course, we all know that Rama will be able to defend the city of Mithila. That is the beauty of Banker’s writing, despite knowing (almost) what happens in Ramayana, the reader’s interest in the story doesn’t waver even for a moment. The author’s has used his own imagination in sketching the characters and in describing the events that place during the course of the novel. The story builds on where it was left in ‘The Prince of Ayodhya’, so if you want to read this book, I would suggest you to read it as per the series. For me that star character of this book was Sita, of course, apart from Rama and Lakshmana. She is introduced not as a delicate princess but, as a warrior princess who is well versed in the art of archery and swords play. The demon lord Ravana is depicted as pure devil whose only aim it to conquer Ayodhya. There is Manthara who to please Ravana plots one evil plan after another to poison the sisterly relationship between Queen Kausalya and Queen Sumitra. She even schemes to get rid of Rama. There is also the story of Ahalya and how Rama releases her from her husband’s curse. The story seems to pace slowly as by the end of the novel we only reach till the swayamvar of Sita. But, the novel is filled with numerous sub plots and stories that keep the novel interesting and enlightening. All the sub plots culminate toward the bigger picture and a momentous climax. Ashok K. Banker takes you on an amazing fascinating journey, from Ayodhya to Mithila. It is an enriching experience. You will feel drawn towards the world of Ramayana as you turn pages of this book, that is the magic of Banker’s writing. I am very looking forward to reading rest of the series. Will try and get hold of this book soon!! !Nice review..